On Wednesday, Stuyvesant Town’s owners, Blackstone and Ivanhoé Cambridge, announced plans to install solar panels on all of the roofs in Stuyvesant Town and Peter Cooper Village. Additionally, they said, it will be the largest private, multi-family residential solar project in the country. The 3.8 Megawatt (DC) solar energy system will span across the property’s 22 acres of rooftops. According to the owners, once the project is completed, StuyTown will have tripled Manhattan’s capacity to generate solar power. Renewable energy developer Onyx Renewable Partners is the project developer for the installation, which is expected to begin this winter and be completed in 2019. The installation will consist of 9,671 high efficiency solar panels and will generate enough energy to power over 1,000 New York City apartments annually. The project is expected to offset approximately 63,000 tons of carbon dioxide emissions, which is comparable to removing 12,000 cars from the road for a year. A spokesperson for Blackstone added that there will be no major capital improvement rent increase for the project, and that early on in the new ownership, environmentally friendly projects were actually suggested by residents in response to surveys issued by management. According to the Wall Street Journal, the project will cost $10 million. Blackstone and Ivanhoé Cambridge announced on Friday that they closed on the deal to purchase Stuyvesant Town and Peter Cooper Village. This means that the companies have assumed ownership and CWCapital, the special servicer since 2010, no longer has any ownership interests in the property. The property wound up with a price tag of $5.45 billion, the New York Times reported, which would make the cost even more than that of the historic sale to Tishman Speyer. However, according to a spokesperson for Blackstone, the net price paid was still the previously reported amount of $5.3 billion. The previous figure includes full payment of transfer taxes. Prior to announcing the deal in October, the city had agreed to provide Blackstone with around $225 million in tax breaks and a loan that will be forgiven. This reported threat came on the heels of another suit against CW, this one by a group of lenders led by hedge fund Appaloosa, being withdrawn. That group had filed suit over CW being able to walk off with a reported $566 million in fees from the sale and other services rendered at Stuyvesant Town. It was the biggest bust of the last real estate boom, but a lawyer battling over Stuyvesant Town money claimed everybody won. “Listen, everybody connected with this property is making a lot of money,” said Greg Cross, an attorney for CWCapital. Cross was in court earlier this month defending his client’s right to a half-billion-dollar payment for services rendered during the period when CWCapital ran the complex and serviced the debt on the original $3 billion mortgage rung up by Tishman Speyer and BlackRock Realty which was sold to investors in five securitized tranches. In October, investment giants Blackstone and Ivanhoe Cambridge agreed to buy the East Side development for $5.3 billion and signed a deal with the city to preserve 5,000 affordable apartments. Ahead of the sale closing, the latest in a long line of lawsuits surrounding the complicated financing deals negotiated for the property drew to an end with the plaintiffs withdrawing their complaints. 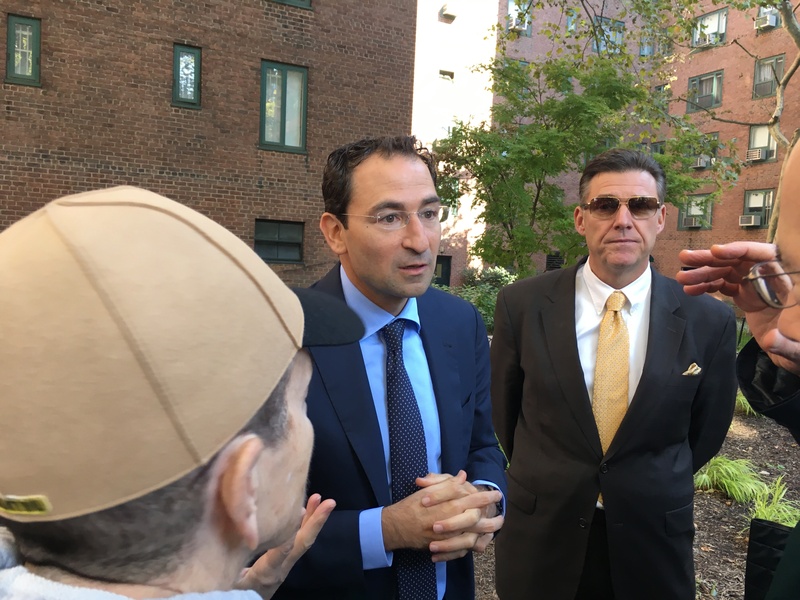 Blackstone’s $5.3 billion purchase of Stuy Town also bought the firm a jumbo 700,000 square feet of air rights that could wind up being “just the tip of the iceberg” in Mayor Bill de Blasio’s plan to preserve and build affordable housing in the city, according to one expert. News of the air rights in Stuy Town — and new owner Blackstone’s claim over them, along with the 110-building property, was reported in the Wall Street Journal last week. While the value of the air or development rights wasn’t clear since it depends where they’d end up, commercial real estate attorney Michael Greenberg, also founder and CEO of the Level Group brokerage firm, predicted many more similar arrangements in the future as the city looks for creative ways to get those elusive units of affordable housing. In Stuyvesant Town, this meant preservation, and if air rights are transferred elsewhere, possibly new affordable housing. Blackstone and its partner in the Stuy Town deal, Ivanhoe Cambridge, have gotten the city’s support to transfer the Stuy Town air rights since the owner has made a commitment not to build on the property’s open spaces or its existing structures. “What’s unusual is that it’s rare for the city to allow it — there have been requests for them to allow the transfer to sites that are not contiguous or to other neighborhoods even,” said Greenberg. What about the 6,000 other apartments? I’m writing to express my extreme displeasure with the terms of the recent sale of PCVST, which the mayor and our elected officials have been touting as a victory in the press. I believe this “victory,” unfortunately, serves the mayor’s political agenda more than it does the PCVST community as a whole. While reserving 5,000 units for affordable housing is a good thing – and an admirable goal to strive for – it will, sadly, come at the expense of the other 6,000+ apartments, including market rate renters, the majority of whom are hard-working families who want to live in PCVST because it is a great place to raise a family and is zoned in a great public school district. These people are struggling like any other New Yorker. There are no millionaires living here. This deal has sold out more than half of this community – and yet there was Mayor de Blasio, flanked by our trusted elected officials, boasting of how he “saved” STPCV. The mayor had a real opportunity to effect real change in this community. Instead he took the politically convenient route: finding the easiest way to add numbers to his affordable housing quota. What he failed to take into consideration is PCVST’s uniqueness. It is a whole community, not a spreadsheet. He could have used his political clout to not only save those 5,000 units, but to work toward a plan for tenant ownership, which would have ensured a true, long-lasting, and better community – and helped the community as a whole. At the big announcement on Tuesday, residents who’d skipped work that morning as well as a number of retirees made up most of the crowd (along with a gaggle of reporters, photographers and cameramen). Many seemed shocked by the news, and not all were thrilled. Residents also gave Blackstone’s Jonathan Gray an earful after the press conference. When one resident asked if CompassRock would continue to maintain the complex, he asked, “What do you think of them?” The tenant then said, “Get rid of them,” before several other tenants also began descending on him with their own complaints. Scheyer, a real estate attorney and member of Community Board Six’s Transportation Committee, said he also wondered how the tax breaks offered to the owner in exchange for preserving affordability in 5,000 units would impact funding for the MTA. “They get a fair amount of revenue from (mortgage) recording taxes,” he explained. Her two-bedroom in Peter Cooper, where her family’s lived since 2008, rents for close to $6,000. After the “Roberts” settlement, the couple got a check for around $100, if it was even that much. So that new deal “is not going to change our situation as far as I can see,” Newnham said. John “Butch” Purcell, a resident of Stuy Town since 1968, seemed more optimistic about the future. Marina Metalios, a 25-year resident, was also cautiously enthusiastic. Metalios is a tenant activist who also works for UHAB, an organization that helps tenants convert their buildings to affordable co-ops, among other assistance for tenants. The Tenants Association meanwhile issued an official statement, praising the commitments made by the owner. “After years of fighting to deliver a more stable and affordable future for our community, today we can celebrate an important success,” said Tenants Association President Susan Steinberg. “We have eliminated the incentives that have existed for landlords to try to kick rent-stabilized tenants to the curb, and provided security for ‘Roberts’ tenants when the J-51 tax abatement expires in 2020. We welcome Blackstone and Ivanhoé Cambridge’s commitment to protecting our valued open spaces, keeping Stuyvesant Town and Peter Cooper as a unified whole, and endeavoring to create an environment that is most suitable for long term tenants seeking to develop roots here. Linda Ayache, a longtime resident, said her concern was about the students in the community or specifically frathouse antics she said she recently witnessed. Last week, Ayache said a bunch of “young people jumped into the fountain and the women were rubbing themselves like it was a wet t-shirt contest.” Security didn’t respond right away, she said. Security itself was another issue Ayache hoped would be a priority for a new owner. “Last night a gang of boys accosted a female at 9 Oval at 5 p.m.,” she said.